Sweetbriar lives in the Stable and just loves being pampered. He insists on being brushed and thoroughly groomed before leaving the stable each morning, and on special occasions even has his mane plaited. 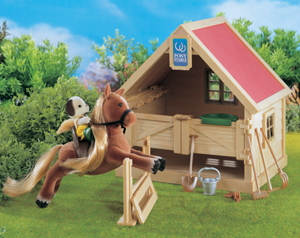 Set includes, Sweetbriar the Pony, stable building, feeding trough, adjustable show jumping fence, riding saddle, reins, bucket, brush, comb and four tools to muck out the stable.